William Augustus Stearns was the fourth president of Amherst College, serving a twenty-two year term from 1854 to 1876, a record of duration he shares with Amherst's second president, Heman Humphrey. 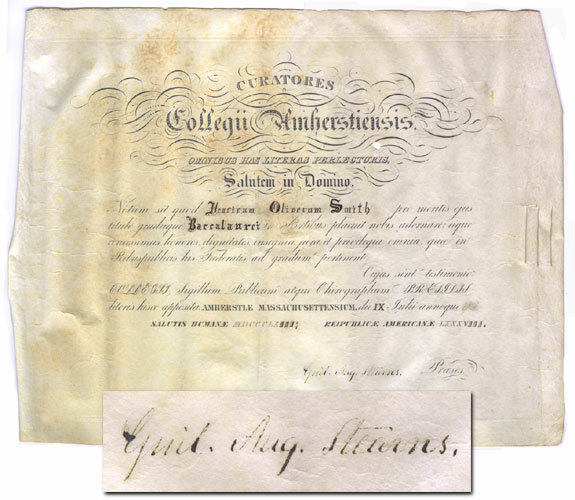 This example of Stearns' signature is found on the diploma of Henry Oliver Smith of the Class of 1863, Latinized to read "Guil. Aug. Stearns." According to the Amherst College Biographical Record, as transcribed by Rick Yanco, Smith's record indicates that he practiced law in Massachusetts for more than fifty years until his death in 1921. He was a classmate of President Stearns' son Frazar, who served in the 21st Massachusetts Volunteers in the Civil War, and died in battle in March of 1862. The bells in the steeple of the College Church were dedicated to the memory of Frazar Stearns and the other Amherst men who died in the war.